* Need to Know: R-22 are Ozone Depletion Potential refrigerants. They will be phased out, cutting down gradually, and terminated totally it in the year 2020. So the price of R22 become significant higher. R-22 price now is double times higher compared with last years. To fulfill market of R-22 now, a few of R22 replacements come into being such as R-422D, R-22B , R-438A ,R-407C... Obviously, the replacements are cheaper than R-22 and not working well as R-22. 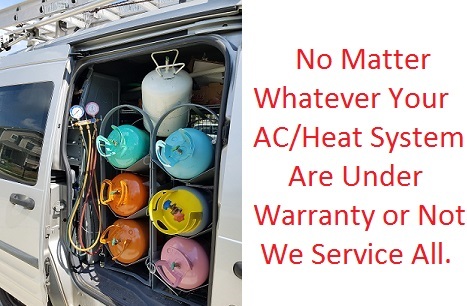 All replacements are drop-in refrigerants. It means that Not To Mix a replacement with R-22 in an AC system or Must Remove All old R22 before filling a replacement. This procedure often spends much time while not much shortage of R22 in a system, so AC Techs often add the replacement and not remove out all old R22. And this itself makes the AC system not to work effectively much, and potential problems are unknown. We Totally Do Not Use R-22 replacement under any condition. If you live in Orange, Durham, Wake Counties or one of the surrounding cities and you don't see your location, please give us a call and we will be glad to let you know whether we service your area.